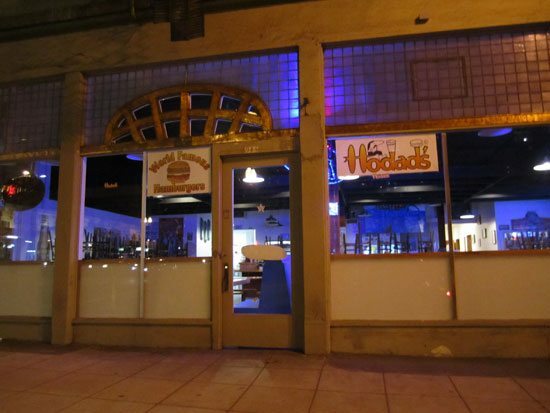 Hodads opens number 2 in downtown San Diego – finally. Following repeated delays and a budget that ballooned to nearly half a million dollars, Hodad’s is finally opening its doors today in downtown San Diego. Co-owner Mike Hardin had pledged earlier this year to have the restaurant ready for the Padres home opener on Tuesday, despite problems with a previous contractor who had initially estimated construction would cost just $150,000. It’s kind of an iffy spot, so far from the heart of Downtown – but that’s been said before. Here’s to wishing them all the best, since I’m counting on it being a little less crowded (and with allegedly twice the kitchen) I’ll probably hit it up at least once this Padres season…but a bi-monthly single bacon cheeseburger with frings is about all my arteries can handle. I had my first Hodad burger 35 years ago on Abbott St. Today I had the first burger served at the official opening of Hodad’s 2. Congrats to Mike, Terry and Brooks. Well, kudos to you Mike James! Congrats, dude. Here’s hoping the best for No #2. James, you’ll have to report back to us and give us some kind of comparative analysis. I also had my first at their little place off Abbott. Later, Mike Hardin told me they used to use “government cheese” on the cheeseburgers. (This is inspiring me to re-run my interview of him.) A true OB success story! You know, with a dedicated following with a little gab,Hodad,s could make it just on baseball and other events around the area.Prabably not turn into the surf/hip version of Jack in the Crack, but be able to put O.B.on the Padres fan map. Don’t forget the Uninted States Navy.